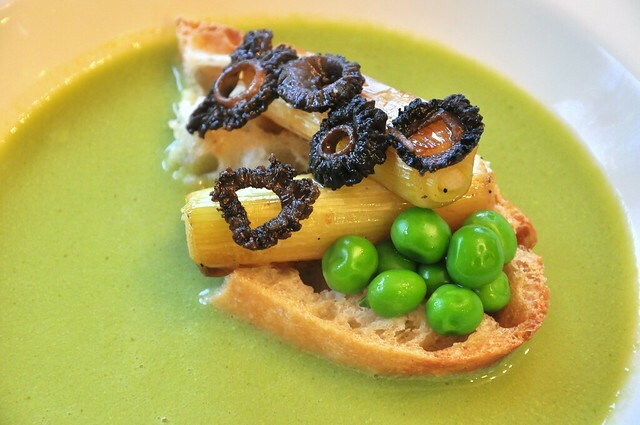 The English Pea Soup is a favorite -- the recipe comes from Jean-Georges Vongerichten from his book "Cooking at Home with a Four-Star Chef" -- the soup base is made from our veg stock combined with the shucked pea pods as an additional flavor enhancer which does a great job of infusing the soup with that essence of springtime. In a large saucepan on medium heat, add 2 tbs. of Earth Balance along with 1 chopped onion, 1 chopped leek, 3 chopped garlic cloves, a pinch of thyme, salt and pepper and cook together for 2-3 minutes. Add the pea pods, then add 4 cups of stock, bring to a boil, then simmer for 20 minutes. Strain the broth and return to the saucepan. 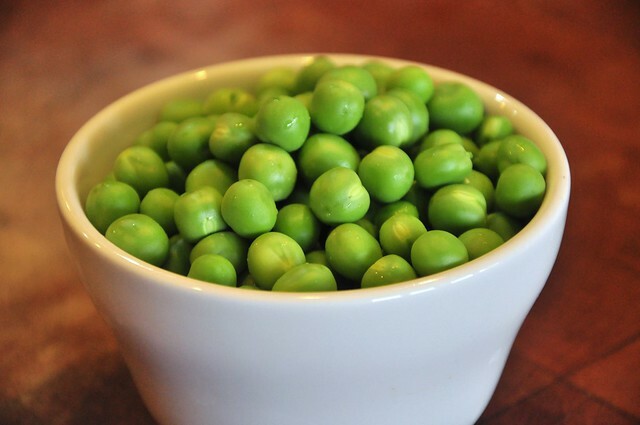 The 3 cups of peas were blanched in salted water 4-5 minutes and drained -- save about 1/2 cup of peas for the garnish and run them under cold water for a minute. Put the rest of the peas in the vita-mix with 2 tbs. of Earth Balance, a pinch of salt and 2-3 tbs. of cooking liquid and puree. Whisk the pea puree is back into the broth, bring to a simmer and cook for a few minutes to combine. Check for seasoning, and serve. 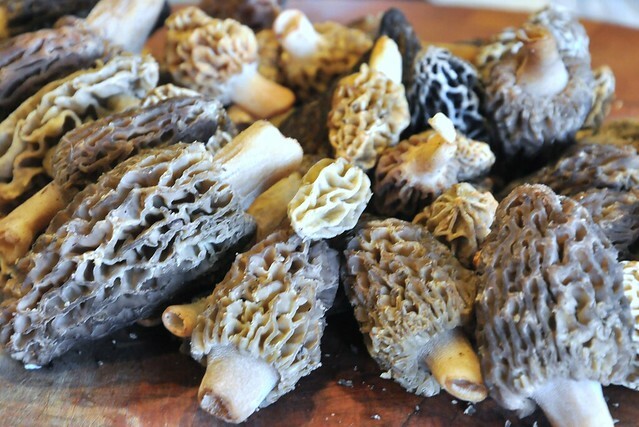 Accompanying the soup were (local) morel mushrooms, cut into rings and pan-fried with some olive oil, salt & pepper. Also on the island were another favorite, braised leeks.